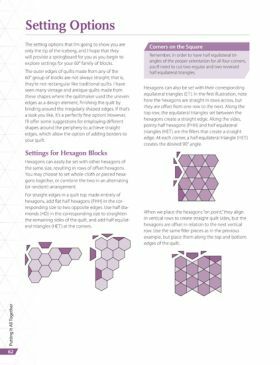 Learn how to make visually striking projects featuring 60-degree shapes, including hexagons, diamonds, and equilateral triangles. 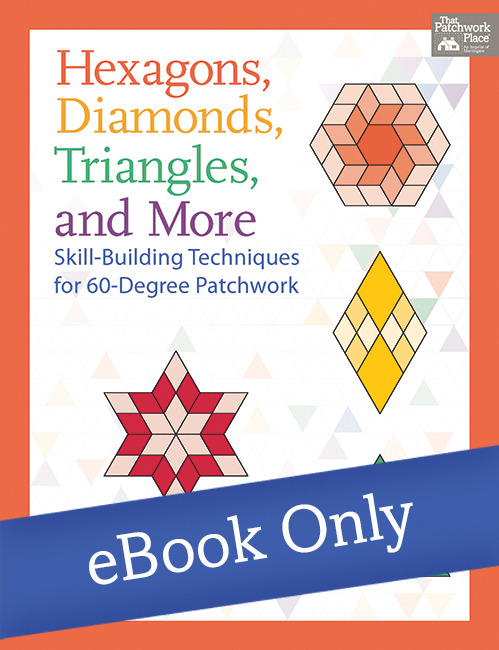 This comprehensive guide offers progressive skill-building instruction, plus problem-solving tips for common pitfalls. Move from confident beginner to the next level and create the blocks you want! 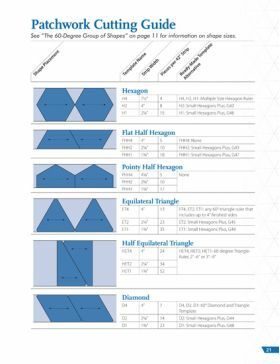 As a quiltmaker who loved geometry at school, Kelly Ashton was delighted to discover the creative design possibilities of using compass and ruler and 60 degree angles. This book contains many different blocks and several projects for you to try out. There is also a gallery of quilts to inspire you. Kelly shows you how to master Y-seams with 'very little more time'. 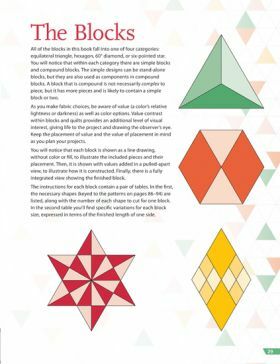 You may need to purchase templates to create some of these blocks, but there are simple instructions for making your own, where ready-made templates are not available. The basic hexagon shape can be subdivided into halves, triangles or 60 degree diamonds, wedges, kites and petals. 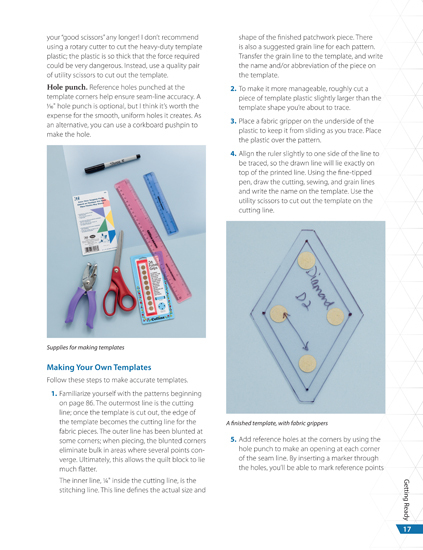 Template-making supplies and all other equipment you'll need are listed and explained. The more than 80 blocks in this book can be categorized as equilateral triangle, hexagon, 60 degree diamond or 6-pointed star. 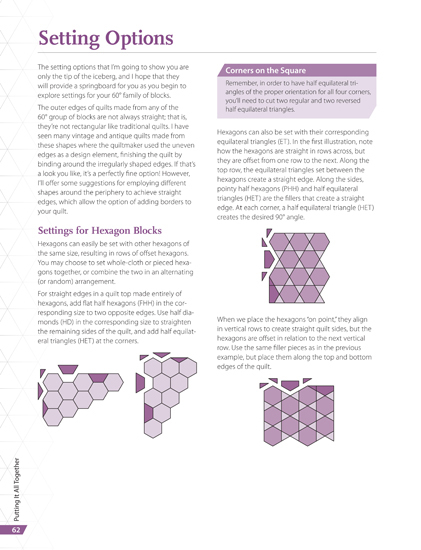 The tables included will enable you to design blocks in a size you want. Instructions and diagrams are clearly set out. 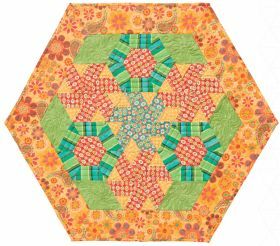 You'll be designing complex quilts by yourself in no time and will be inspired by the gallery of photos showing 12 completed quilts. Patterns for a ["Fiesta"] table topper and "Liberty" table runner are included. Full sized template patterns are provided. 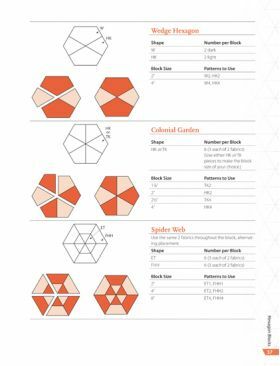 Kelly takes the fear of quilt geometry out of the equation, in her new book published by Martingale. 60 degree quilts can be daunting and many sewists are guilty of steering clear of them. In Hexagons, Diamonds, Triangles and More, all of the math has been done. 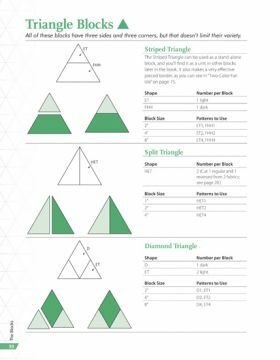 Templates and patterns are provided which mean that making one of these quilt projects is a little less intimidating. 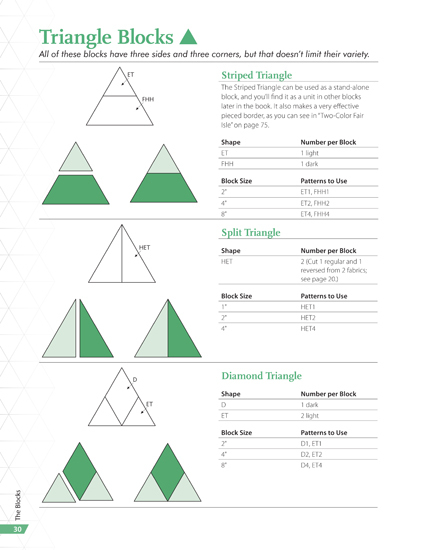 The instructions are very good and are accompanied by images and measurements to assist in the quilt making process. 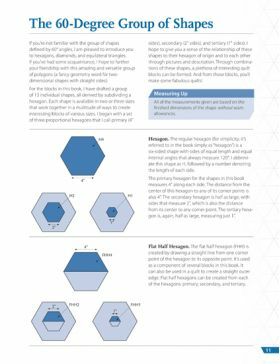 Hexagons, Diamonds, Triangles and More is an excellent resource and once purchased, will be referenced for years to come. 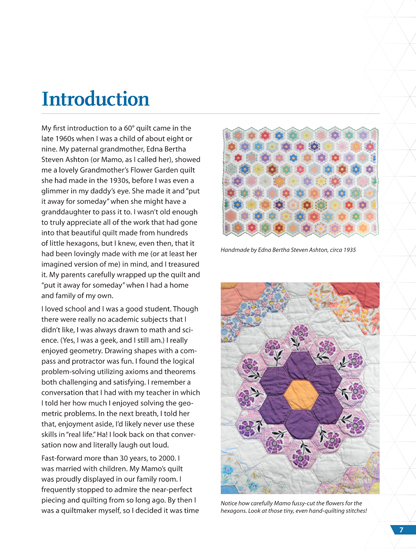 Kelly's romance with quiltmaking begain in the mid-1980s, though it didn't fully blossom until the mid-1990s when both her sons were in school. Then, in addition to "quiltmaker," she soon added "quilting instructor" and "long-arm quilter" to her list of preferred activities. As a self-described "pragmatic quiltmaker," Kelly approaches quilt design and construction with a knowledge of and appreciation for the theoretical and a penchant for the practical. Kelly resides in Overland Park, Kansas, with her husband, Jeff Seib, and their miniature schnauzer, Shyma. She is mother to Michael and Steven, and Nana to Connor, Sara, and Vayda. In addition to her quiltmaking passion, Kelly enjoys singing with the Kansas City Women's Chorus, traveling, being mesmerized by the ocean, cooking, playing pinochle, and spending time with family and friends.